Studio barre classes have exploded in popularity all across the country in recent years, and for good reason! They’re great for losing weight and gaining strength. But…what if there’s not a barre studio close to you? Or what if you don’t want to shell out the big bucks for pricy boutique classes? That’s where Xtend Barre on Openfit comes in. From the comfort of your own home, you can get all the benefits of a barre class …plus more! The creator of Xtend Barre, Andrea Rogers, designed the workouts to be a blend barre, Pilates, and cardio to help you sculpt a strong, lean body while working up an amazing sweat. All it takes is 30 minutes a day, and you don’t even need a barre – just something sturdy to hold on to, like a chair! Better yet, these workouts are designed to give you serious results. Here are 11 people to prove it! 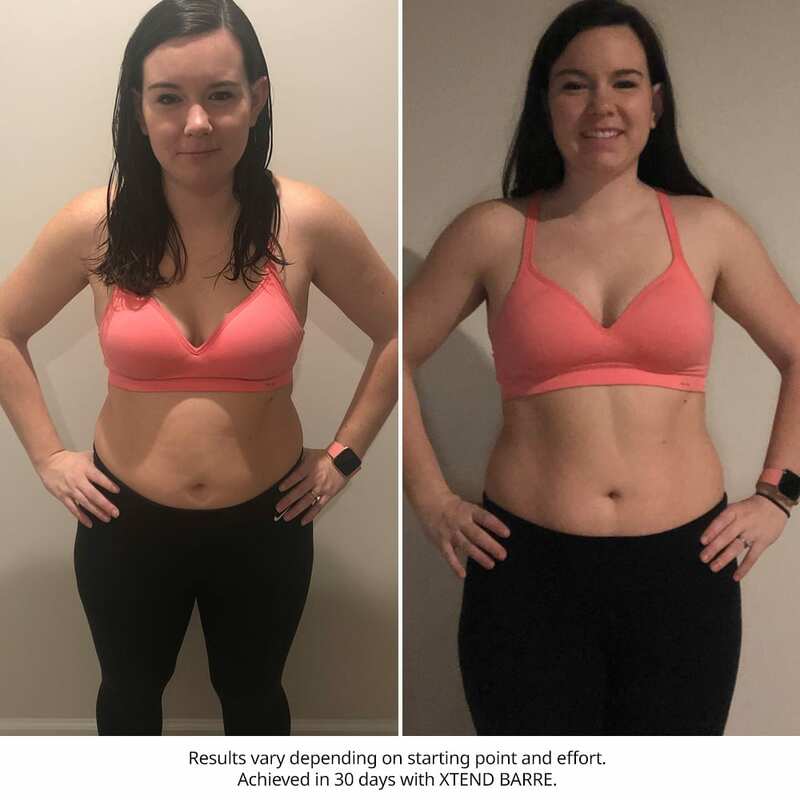 Check out their results from just 30 days of doing Xtend Barre, and what they have to say about the program. Taylor N. Lost 8 Pounds and Can Fit Into Her Old Clothes! I recently came across Andrea Rogers on Instagram and quickly fell in love with her style and vibe. When I saw the Openfit opportunity I knew I had to try. I have wanted to change my lifestyle for a long time and knew this would push me to stay accountable. Before Xtend Barre, I was always so tired and anxious when having to do anything with my twin one-year-olds. I frequently felt sluggish and overwhelmed. Since completing the program, I have more energy and feel a lot more confident. I definitely have a lot more motivation to get things done! Physically, my arms are more defined and stronger, I’ve lost 8 pounds and fit back into my old clothes, and I’ve gained strength and endurance! I loved the variety of exercises. You work your body in so many different ways using limited materials and I never got bored! I loved that I could do it anywhere so I didn’t have any excuses not to get it done! I also love that Andrea is so genuine and motivating! She pushes you to do your best and to take it to the next level. Her cues are clear and directions are helpful and simple. She’s a realistic trainer that designs and executes programs for everyone to find success. Anyone can do this program! The workouts are not geared towards dancers and the terminology is easy to pick up on if you do not have that background. 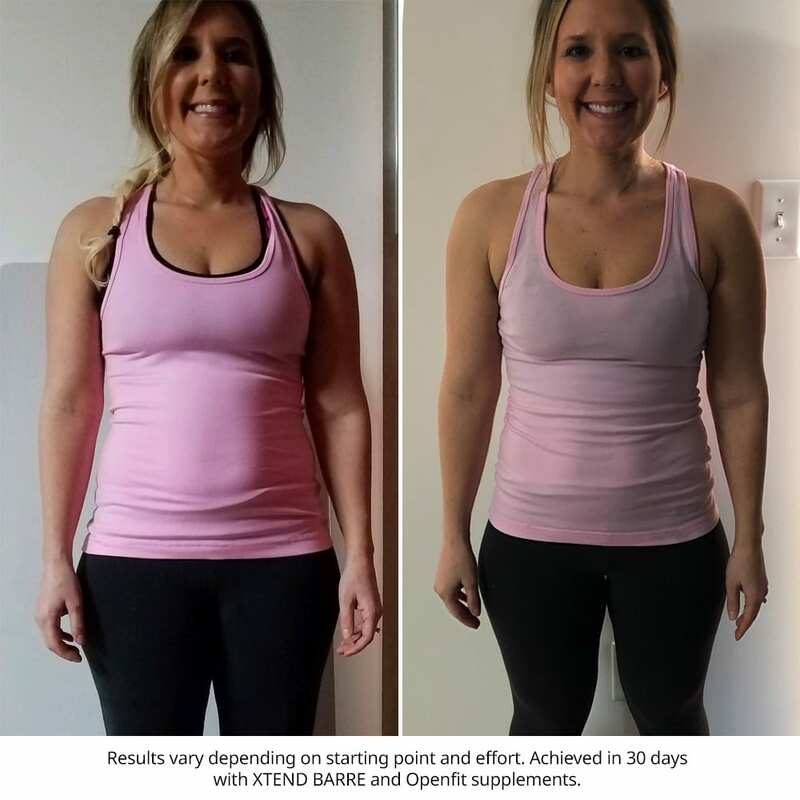 It’s an amazing way to change your body and mindset in only 30 days! You don’t need a barre or any dance background to have amazing success! 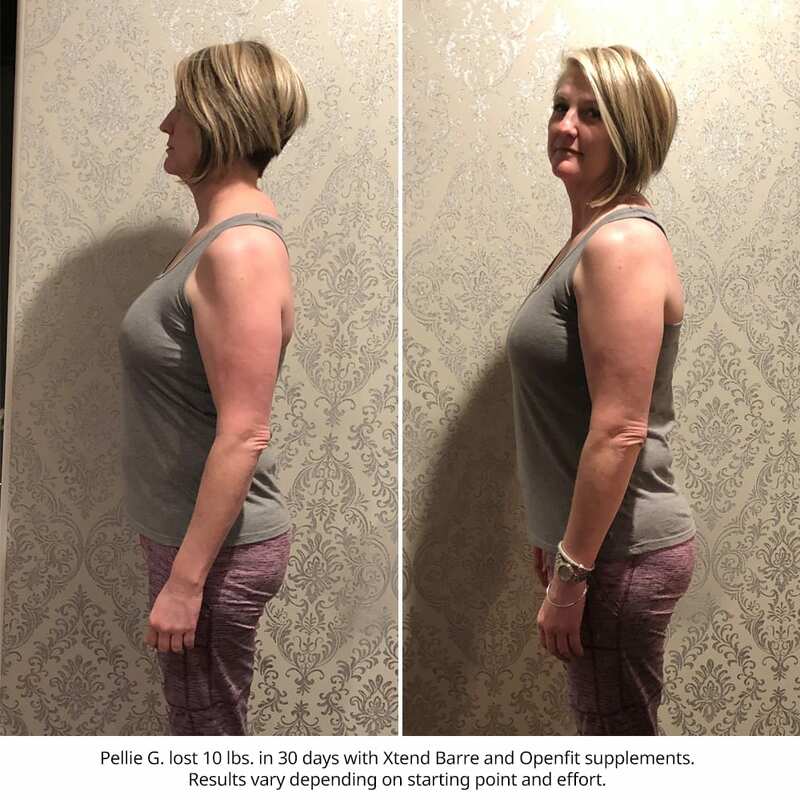 Pam C. Lost 7 Pounds and Had to Buy Smaller Pants! I was motivated to start this program because I love barre, and have taken Xtend Barre classes in a studio in the past and loved it. I was also looking for something to push me to the next level to lose some weight, especially in my stomach. 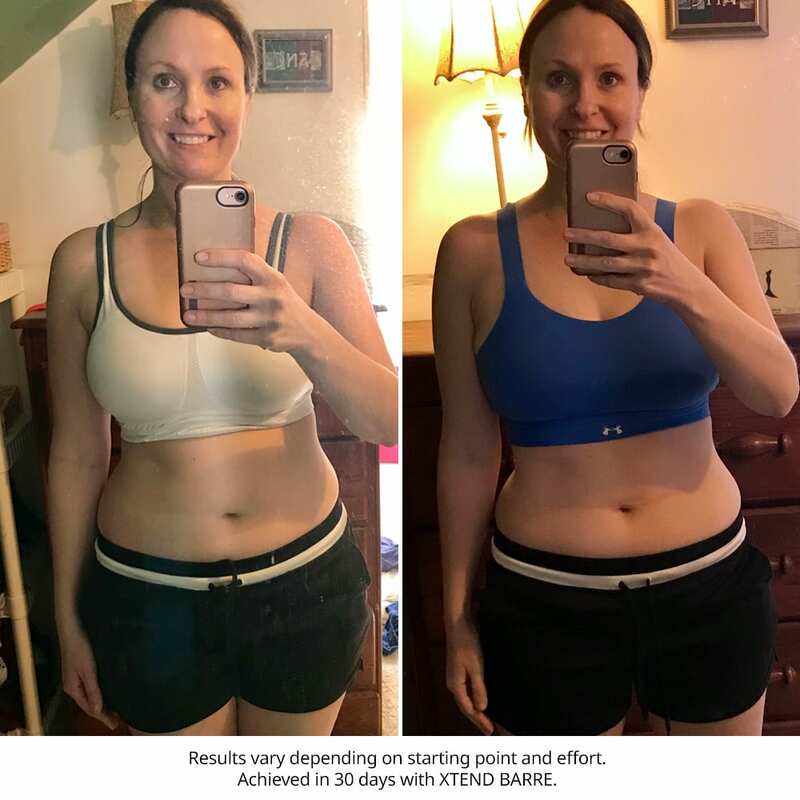 I liked that Xtend Barre gave me results that I can see and feel, and it all happened fast. I lost weight and an inch and a half from my waist! I notice that my stomach is definitely getting smaller and more defined, and my thighs are getting smaller. My pants were falling down and I had to buy some smaller ones! I notice I’m able to do more of the advanced moves at the end and last longer. I’m definitely gaining more flexibility and strength and feel stronger overall. I also liked that these are 30 minute workouts, so you can find time to squeeze them in the midst of a crazy life and don’t have to worry about class times. It’s great to do at home, and you don’t need a barre – I used a chair and it worked great! Andrea is extremely motivating. She pushes you to keep going and not give up, even though she’s not in the same room. Her cues help make sure you’re doing the moves correctly and remind you when you start to slack a little. She makes you feel like you can keep going, and you do. Her energy keeps you hyped up through the entire workout so you do keep going. Before I started Xtend Barre, I was a little down! I needed something to look forward to or a new group to be apart of. 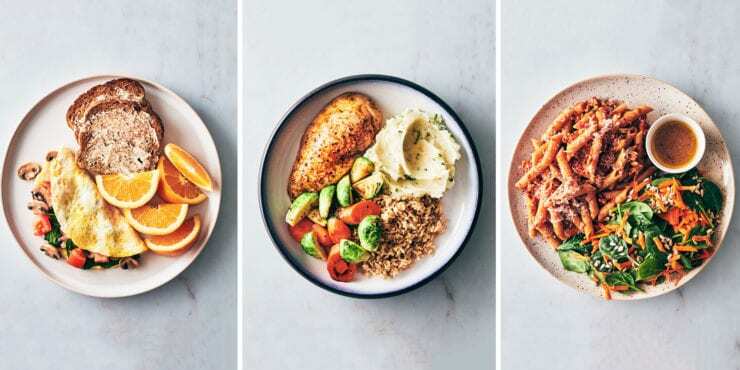 I was motivated to try this program because I thought the length was doable, and I also wanted to try healthier eating with a new type of physical activity. Now, I feel so much more flexible, and I’m showing signs of actually having a booty now! I liked that I lost weight while having fun…I lost 10 pounds!! I have never been a dancer and loved every minute of this program. If someone is thinking about doing this program, I would just say go for it! IT’s the best 30 days ever! 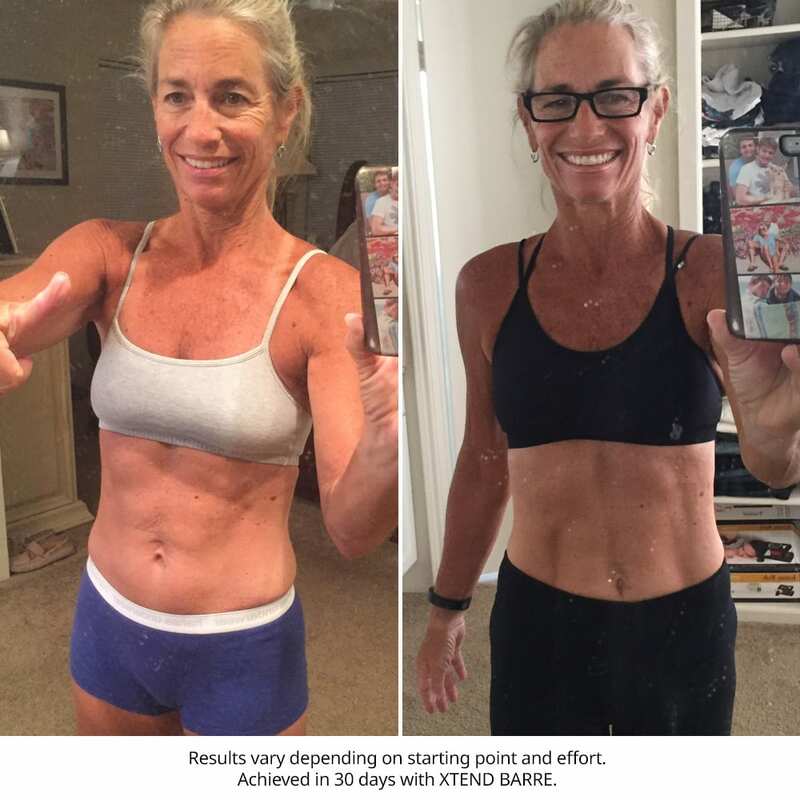 Before I started Xtend Barre, I wasn’t confident in my body, I felt weak, and had no energy. Now, I feel stronger, leaner, and more capable. I stand taller and my pants are looser! Andrea is awesome. She motivated me to keep going when the workouts for hard! She pushed you to go beyond your comfort zone. She knew exactly when to give the cues to tighten your core or lift your chin! Xtend Barre is for EVERYONE! I didn’t require dance knowledge or even flexibility. Andrea encourages everyone to work on their level! I liked how quick, but hard the workouts were. They pushed me, and it was easy to push myself knowing I only had 30 minutes. I’ve been following Andrea on social media for months. As an avid barre member for years, I really wanted to test out this at home routine and see the results it could bring especially with only 30 minute workouts. I had also been in a little bit of a workout rut since the holidays and wanted something easy and flexible that could motivate me to lose a couple pounds and lean down. The biggest physical improvement has been loss of fat and starting to tone back up my mid section. I’ve also noticed more definition in my arms! I’m looking forward to the next 30 days for even more toning! I loved the flexibility, being able to take it anywhere (I travel a lot) and the short time commitment, but still get a killer workout. You don’t need any experience with dance or flexibility, you’ll build that through the program! All the dancer like movements start out slower and then move to tempo. Andrea is amazing. I love her presence and positivity both in the videos as well as on social media. She’s a great advocate for her brand and lifestyle and she motivates you during the workout. Her vibe and energy really help when your feeling the burn or unmotivated to even start the workout. 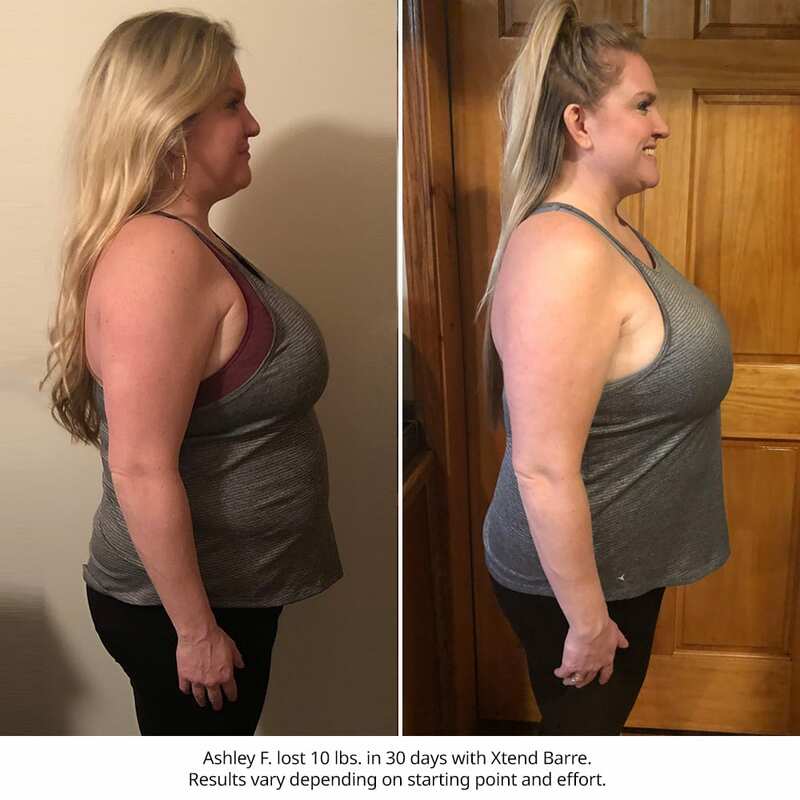 Mallory S. Lost 5 Pounds and 3.5 Inches In Her Waist! 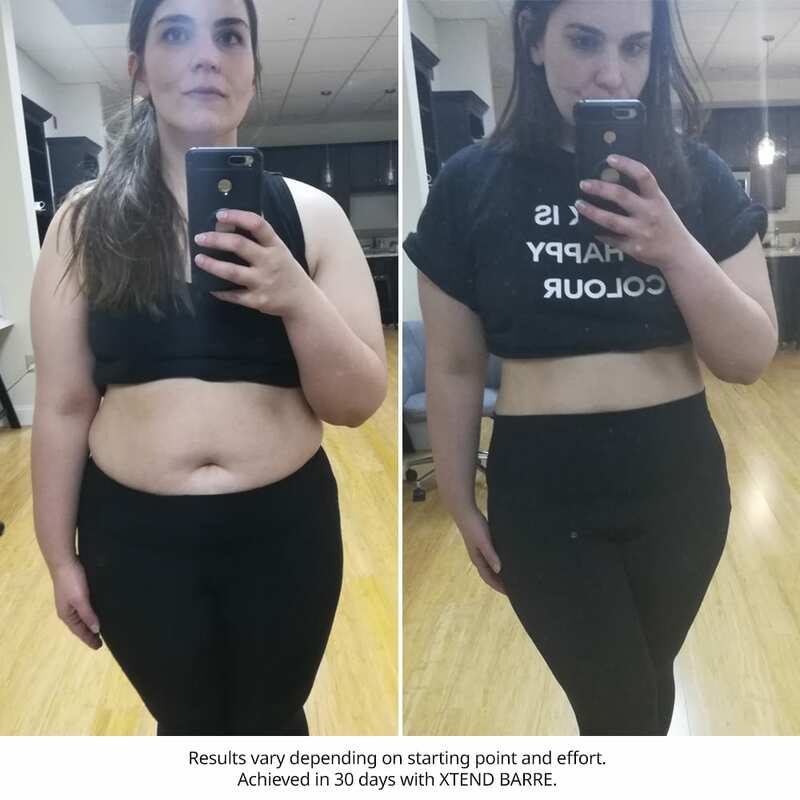 Before starting Xtend Barre, I felt tired and flubby and all my clothes were right. I’m now stronger, my endurance is improved, and I have more energy! Plus, my hips and waist have shrunk, and I’ve lost 5 pounds and 3.5 inches in my waist. This is the best workout I have ever done and I have tried a lot of workouts. This workout is changing my body. I can feel my entire body leaning out! And the workouts can be modified and as you improve you can move up to the more advanced levels. Andrea is very motivating. It feels like she is talking to you and she keeps you going even when it hurts. I love both the pre and post workout supplements. The Fuel pre-workout supplement gave me an extra boost for my workout and the Recovery post-workout supplement was like a treat for completing my workout and helped keep me full so I didn’t snack. 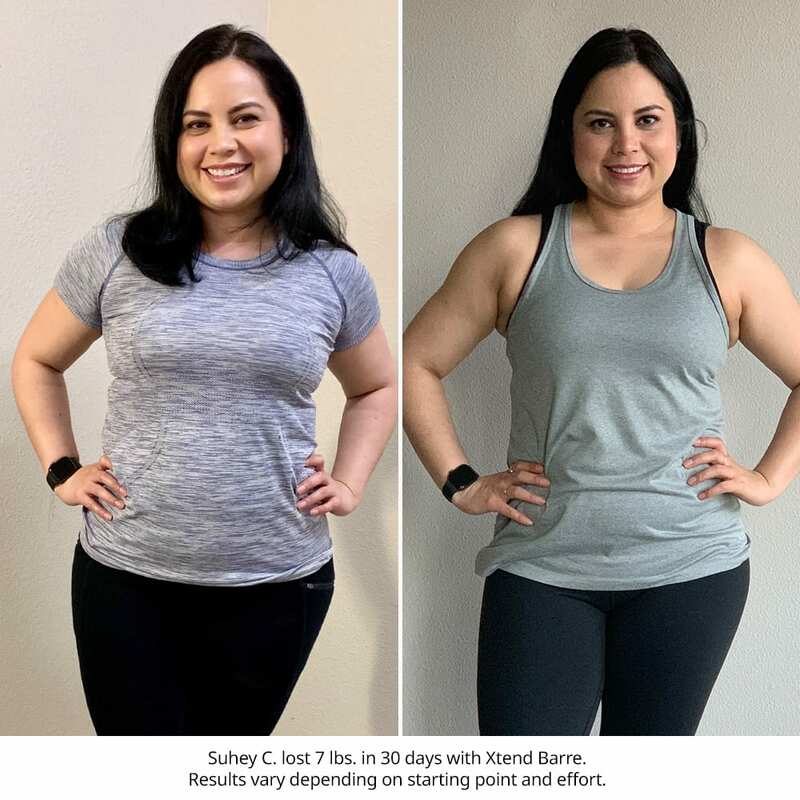 Suhey C. Lost 7 Pounds and Has More Muscle Definition! Before doing Xtend Barre, I felt like I lacked confidence and was unhappy with my body. Now, I’m more confident, stronger and have lost seven pounds! I have also seen improvement in my overall endurance and have noticed my arms and legs are showing some definition. Anyone can jump right in to this program, even if they don’t have any dance experience. The moves are easy to follow because Andrea cues each exercise and modifications if needed. She’s is great! It’s like she knows exactly how I’m feeling and when I need the extra encouragement. If anyone is considering or thinking about whether this is the program they should try, I say, do it! This is the best investment in yourself that you can make. You have nothing to loose but weight. I’ll be 50 in July. 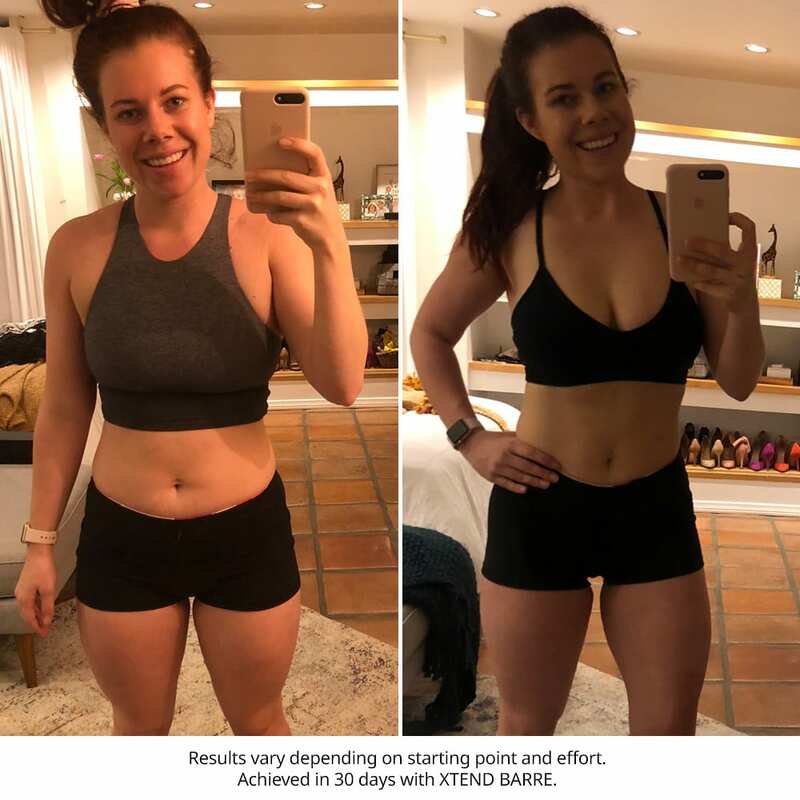 I decided to do Xtend Barre because it was time to get back in shape and take care of me! With this program, I improved my flexibility and strength. I have more energy, a flatter tummy, and tone in arms and legs. I also started the Fuel pre-workout supplement on the second week and loved the extra energy. I’ve had the Recovery post-workout supplement about a week and I like the taste. Andrea is AWESOME! She’s a great motivator, and has the best energy and encouragement. She pushes and makes you feel like you can do it! If you’re thinking about doing Xtend Barre, you should do it. It doesn’t take a bunch of stuff and it doesn’t matter if you wear the same outfit every day! I was really wanting to a workout program at home because I do not live close to a gym. I was interested in trying out a barre class, so I was very excited to begin Xtend Barre! Before I started, I wasn’t really exercising but wanted to find a fun workout I could do from home or when traveling. I loved all aspects of this program: the time frame, the variations of workout and the different goals. Now, I feel stronger since the program and have noticed some weight loss and inches lost from my waist. I also feel like I have more endurance. The program is easy to follow and doesn’t intrude on your personal time with it being only 30 minutes. The modifications make it great for any level. And Andrea has a great energy and skill to motivate. Her motivation has helped me finish up the last steps of the routine. 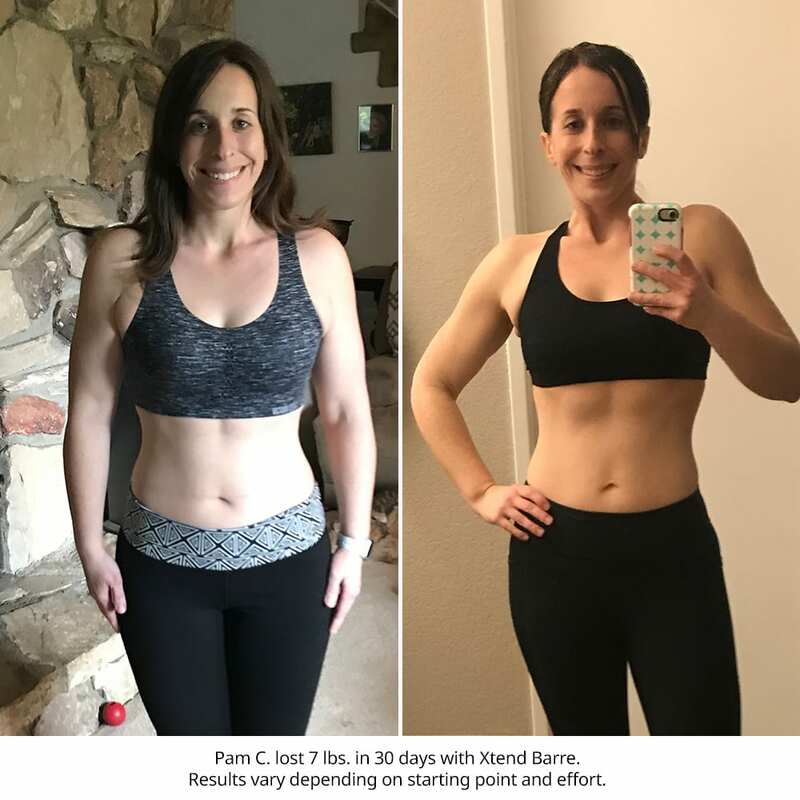 Tara M. Got In Shape For Her Beach Vacation! My motivation to start Xtend Barre was because I’m going on a tropical vacation and wanted to look and feel my best. And after finishing the 30 days, I’m more toned in my ab area! I liked that the workout are 30 minutes and that they feel effective. You can do the workout at home without a lot of equipment, and workouts are explained well and for all levels. In just 30 minutes you feel the burn and sweaty. Plus, Andrea is great at giving cues and pushing you! Jill N. Feels Strong and Flexible at Age 57! I have been doing Xtend Barre in studios for six years, and having the ability to continue my daily ritual in my own home (or anywhere) is an amazing opportunity. At the age of almost 57, I have never felt more comfortable in my own skin. I continue to be strong and flexible due in large part to my daily Xtend Barre habit. Anyone can do Xtend Barre…just follow along! I had no ballet background, but now know all the ballet terms to describe the movements. It’s easy to pick up as you continue to do the classes. Look at me…a jock with no ballet background, and I love how Xtend Barre makes me feel and what it does for me. You just need something to hold onto for balance…a chair, desk, bed, countertop and some open floor space and you are good to go! I also like that it is low impact and adjustable for injuries. Plus, Andrea is an amazing teacher. Throughout the entire class she is instructing and correcting without missing a beat. Her joy of dance, fitness and movement shines through.